It was almost noon when the frost finally started to melt. As I was waiting near the paddock, in the Sambata de Jos Stud Farm, the groom brought the third stallion I wanted to photograph. 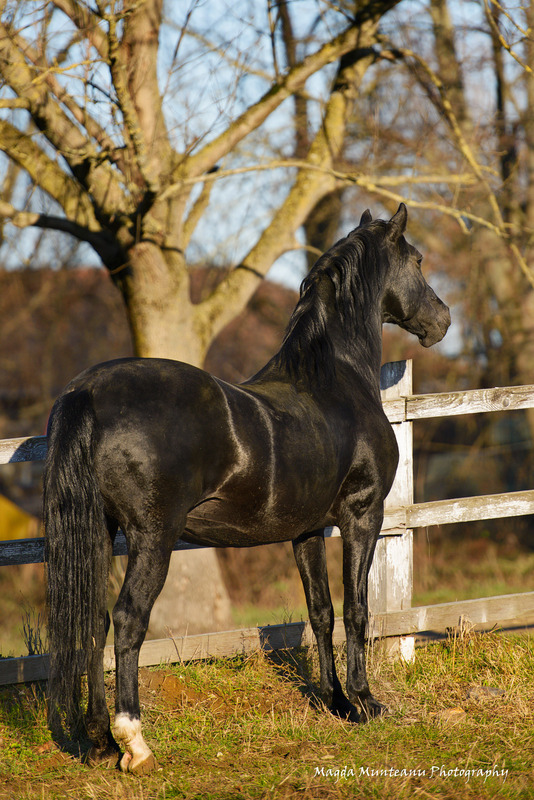 It was a black, shinning Lipizzaner. He raised his feet high when he trotted, as if in parade. I have to admit I felt a little intimidated by this guy when he passed by me. He was so tall and seemed to have so much force. I wandere d if my arms were long enough to hug him if he let me. Then he was free and the show began. Jumps at full speed. Instant changes of direction. Shooting him seemed like mission impossible. A few minutes later, a large horse truck from Hungary entered the yard. The groom had to go and lead the guests who had come to buy some mares. I was happy of this unexpected event. I could spend, alone, around half an hour with this impulsive stallion. I was hoping he would calm down and let me take some close-up photos of him. The groom left and I looked for a better spot. 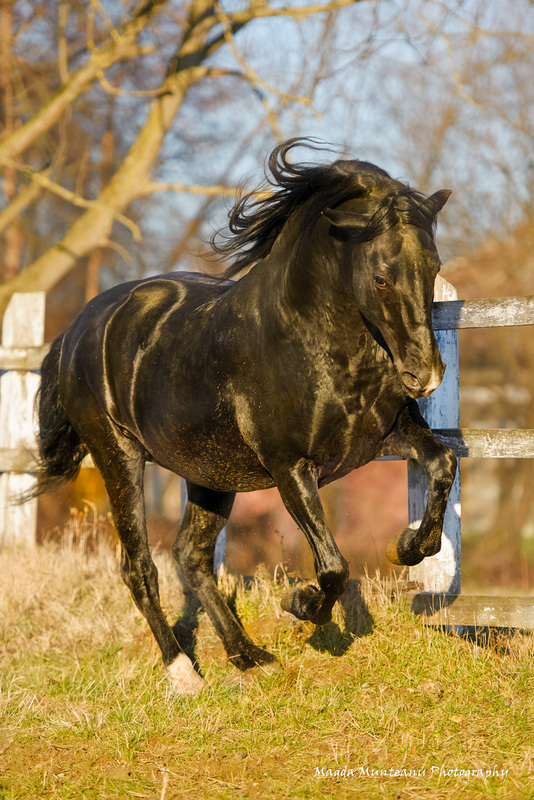 The horse sensed his newly-earned freedom and, in less than a minute, was bathing in the ugly mud paddle in the corner of the paddock. His feet were up in the air and he looked like a big dog having fun. After the initial shock, I started laughing. My beautiful Black Beauty had transformed into a Mud Beauty impossible to photograph. My hopes had gone down the drain. I put the camera down and just enjoyed the view. 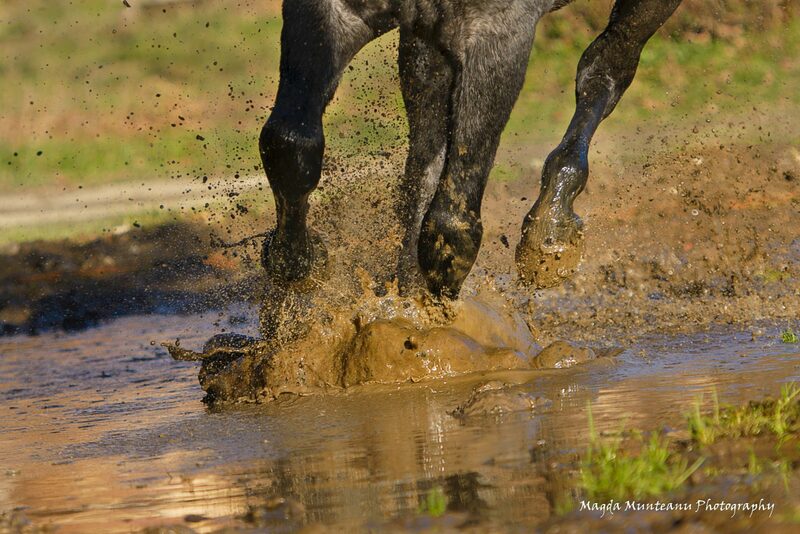 A dark stallion running in the mud, bathing in dirt and playing like a kid.